Today, on November 13, 2018, the Hambi9 who were arrested in the district of Düren were brought before the local court. After about 5 hours the verdict was spoken: acquittal for all defendants. The charge: resistance to law enforcement officers. The Hambi9 were arrested during a police action in which “escape routes were cleared of barricades”. Some had been carried away, others had refused to come down from tripods etc.. But no useless attempts were made by the defendants to defend themselves actively against their arrest. For the defendants UP4 & UP6, both prosecutor and defense pleaded for acquittal. On the other hand, in UP5 & UP9 the attorney had demanded a sentence of 50 daily sentences a 12 Euro. The deadline for appeal is one week. Warm Solidaric Welcome to UP2 and others recently released. After over two months of being fucked with by the cops UP2 has been released this week. Your letters and humor was a weapon and response to injustice and force that has inspired many on the outside. THANKS AND WELCOME on the outside. Many of us would like to extend a warm welcome back to the Forest and the world outside of the walls to 3 of our recently released comrades. YOU WERE AWESOME, THANK YOU!!! Update March 16th: Yesterday’s trial of Hambi4 has been even less transparent than usual, with defense being very limited in access to “evidence”. The UP2 (prison and correspondence name: Foot) who for last 2 months has been kept in isolation from other prisoners has been kept in prison while others have been released. Keeping one person, or a group on the same charges while releasing others is a classic repression tactic, let’s respond then with more unity and solidarity and unity by focusing prison support and letter writing on supporting Foot. One is too many! Over 30 people blocked the courtroom and police transport vans yesterday demanding to be able to talk to UP2 before being taken to jail and only unblocked when it was agreed to. Come and support in great numbers. Also all forms of support and solidarity from others who can not make it would be constantly appreciated especially as: The Four presently are being put on lock-down with their whole cellblock and not allowed to go outside for the only 1 hour in fresh air when they can walk around during the so called freistunde “free hour” anytime there is a solidarity demonstration outside, which recently has been very often. They are however able to hear the people outside and that has constantly brought their spirits up. This is also another proof of how prisons functioning as solely a repressive apparatus as officially putting a whole cell block under lock-down is to be done for “security” reasons and not as a punishment. Are people with drums and megaphones likely to break prisoners out? You decide. In reality it is also a form of collective punishment in which especially any right wing and neonatzis that might be in the same block as The 4 might extend threats towards the Hambi4 for being the “cause” of their “privileges” being taken away. So besides attempt to punish it is also attempt to set prisoners against each other. So please keep writing and reading the ABC Rhineland blog as there is no guarantees that their trial will result in their release. Join us this Tuesday for a Hambach Forest Struggle Solidarity Evening in Hull, located in Manchester Area. Evening will include presentation, documentary screening, prisoner solidarity letter writing followed by music by the Improvisers Circle and Rave Machine. 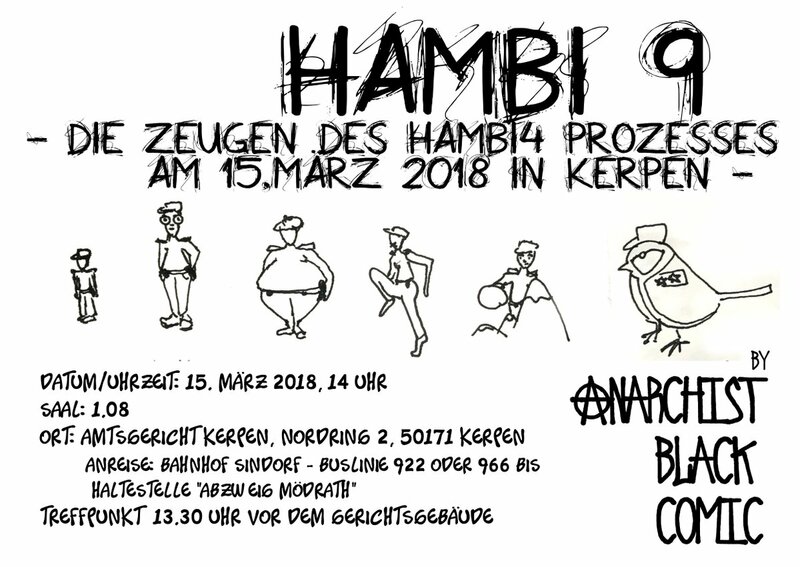 There will also be vegan food for those not just hungering for climate justice and freedom for Hambi4.